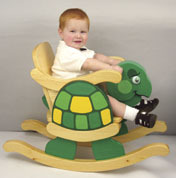 "Both of my sons love the Infant Rocking Turtle Chair Plan." "We hung the Swinging Pony under a tree in our front yard and kids ride "em all day! The grand kids want to come over so that they ride "grandpa's horse."" 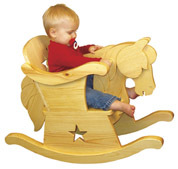 "I would like to thank you for the great Infant Rocking Horse Chair Plan. My child's enjoyment never ends!" 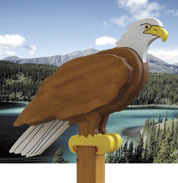 "After my first two original eagles were up for one winter, I put a nest up and shortly after Easter I put two eggs in the nest. My plan was to take them down in the summer and put them back up next spring. However, a little girl and her grandpa were walking by and she asked me, "When are those eggs going to hatch?" Being a grandpa myself, you don't disappoint granddaughters, so I modified the original plans and put up two young eagles to replace the eggs. They will leave about November 15th and in the spring, I'm sure there will be eggs back in the nest."